A Kent secondary school has the worst GCSE results in England, according to the government's latest league tables. 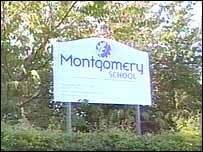 Montgomery School, in Canterbury, was the bottom-ranked school overall, with only 4% of its pupils achieving five or more A to C grades in 2004. The school is under threat of closure and is working with Hugh Christie College in Tonbridge to try to improve. At the top of the table, Gravesend Grammar for Girls and Highsted Grammar in Sittingbourne scored 100% A to Cs. Kent County Council said Montgomery School, which has 340 11 to 16-year-old pupils, serves a relatively deprived community in challenging circumstances. There have been six head teachers in as many years and last year there were significant gaps in staffing. Paul Carter, the council's cabinet member for education, said Hugh Christie College and its head teacher Chris Gerry had been working closely with Montgomery for more than a year now. "Clearly, 18 months ago all was not well at Montgomery School. "That was picked up by Kent officers and we did intervene." He said that the support being offered to the school had not yet had time to affect the GCSE results. Dr Gerry said: "I believe the right strategies are now in place to significantly improve performance." Mr Carter said that overall, Kent continued to perform at above average levels. In the value added tables, which show the progress of pupils from 14 to GCSE, Kent was in the top quartile of schools. "Our goal is to make sure that the under-performing schools achieve the same as those at the top of the tables," he said.